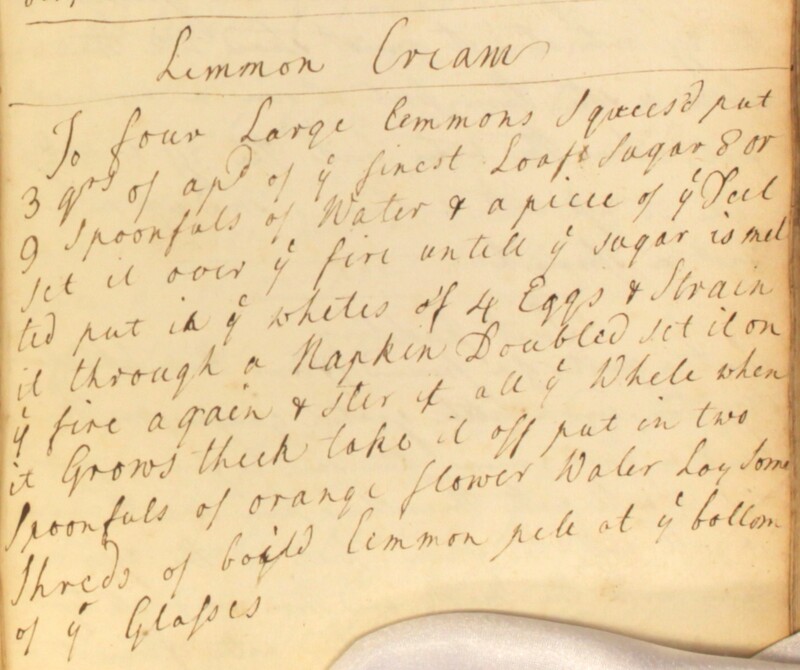 If this orange cream is any bit as delicious as the lemon version created by our Cooking Up History team, then it’s well worth a try! Take the juce of 4 sivil oranges & let half a pint of water be poured over night to the peels greated, & in the morning strain it to yr juce. Take the yolks of 5 eggs & 2 whites. Beat them very well with a qr of a pd of loaf sugar. Stir them into yr juce & water, then strain it into a sliver skillet & stir it continually one way till it be pritty thick. Take it of & stir into it the bigness of a walnut of fresh butter till you cant see it. Then put it in cups. You may sometimes put white wine insteed of water. Before we knew it, Advent was upon us and it was time for us to roll out some mince pies and mulled wine for our final Cooking Up History Session this year. Our seasoned cookery volunteers Christina and David joined us to create Lemon Caudle and Mammas Mince Pyes from our Georgian-era Cookbook of Unknown Ladies. 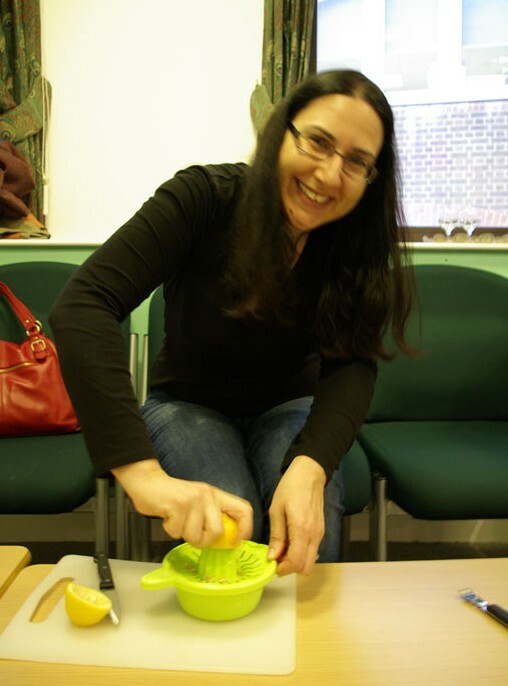 We were also delighted to welcome food historian Annie Gray to our session. With a professional in our midst, we were keen to show off the knowledge and skills we’d accumulated over the past year, as well as learning some new tips on historic cookery. We began with our mince pies. The recipe was met with some hesitancy by the group, as the list of ingredients included a rather hefty amount of beef tongue. Fruit, spice, sugar… and meat? 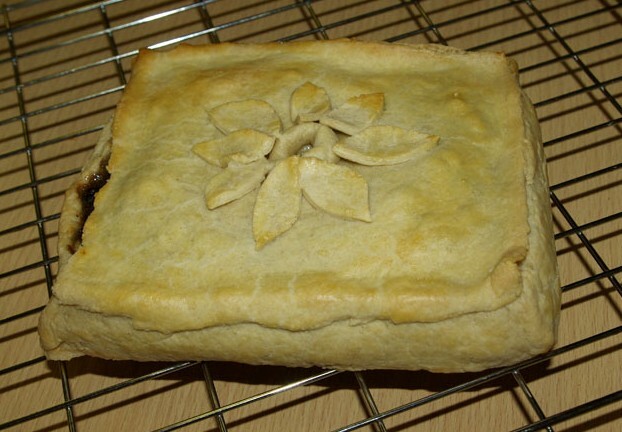 It challenged our preconceived idea of a mince pie should be! But Annie allayed our fears, telling us that once we’d tasted a proper mince meat pie, we’d never want to go back to modern shop bought ones. We determined to stay true to our 18th century ladies and forged ahead with the recipe. David began dicing our meat: cured ox tongue. We’d decided against preparing the tongue from scratch, as the skinning and boiling would have taken more time and space than we had available. There was the added bonus, of course, that for the more squeamish among the group the meat looked and handled just like ham. 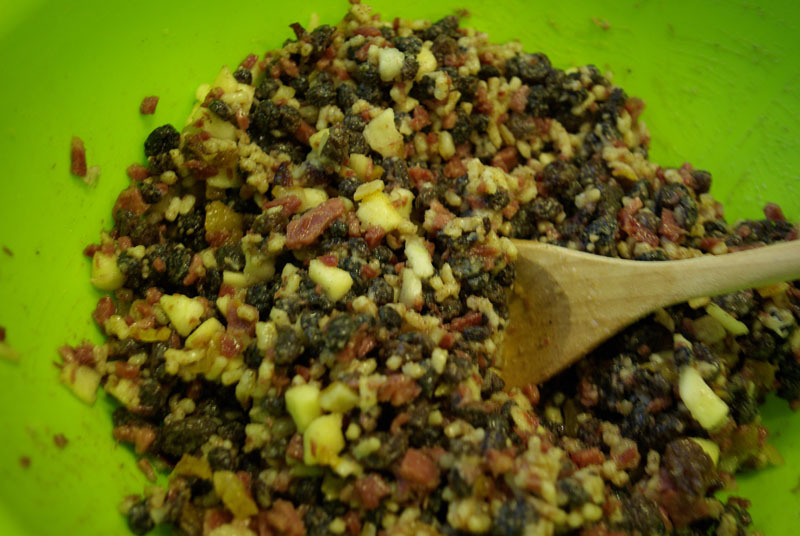 We then added an fruity mix of apples, currants, raisins and sweetmeats (dried apricots, dried cranberries and candied peel and ginger) to the mixture, stirring well to combine. Sugar and spice were then sprinkled in, along with a good measure of sherry. Christina had expertly rolled and lined a muffin tin with shortcrust pastry. 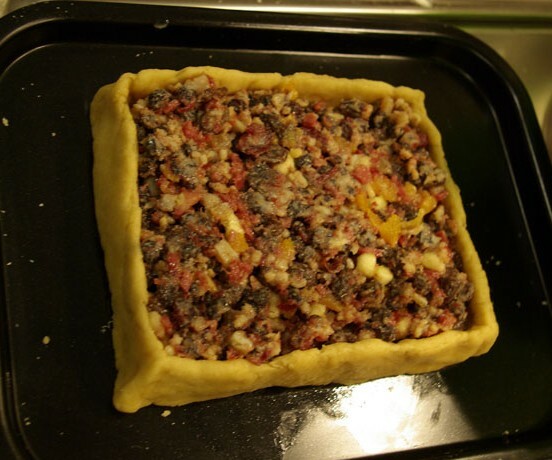 We filled some of the pastry cases with the meaty mincemeat and others with vegetarian mincemeat so that we could compare ‘Mammas mince pyes’ with their modern day counterparts. Annie then showed us how to craft a hand-raised mince pie, building up the pastry little by little to create a free-standing pie case. We were all very impressed by Annie’s expertise! After just over half and hour in the oven, it was time to take out the pies and have a taste. Golden brown with crisp short-crust pastry, they were a proper festive temptation and an ideal start to our Christmas celebrations. Our concerns about the meat had been unwarranted. 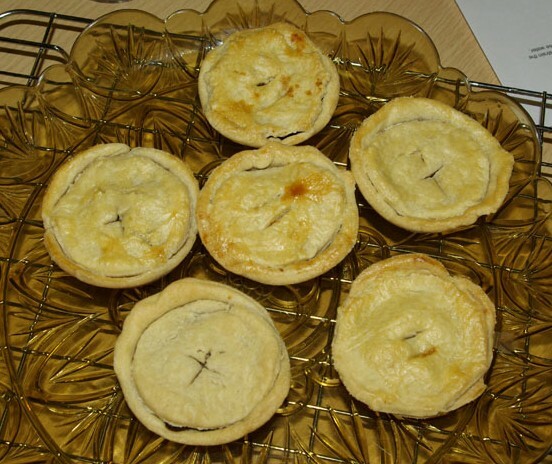 Much to our surprise, the ox tongue added a richness to our mince pies which really enhanced the taste. Our golden mincemeat pies, ready for tasting! 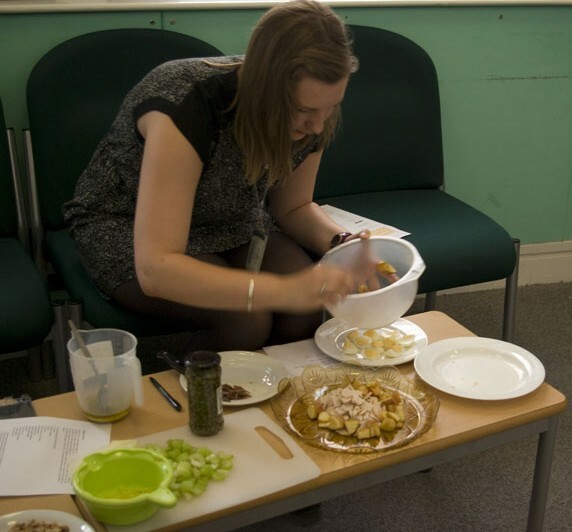 Christina noted that there was something extremely satisfying about all the ingredients – apples, raisins, sultanas etc and that they blended surprisingly well. The sherry gave the mixture real depth, and the nutmeg, cinnamon, allspice and ginger provided the warm spice flavours that we have come to associate so closely with Christmas. But unlike the mince pies we buy in the shops today, these 18th century style ones weren’t too sweet – the sugar was really well balance by the saltiness of the tongue. The effect was really very pleasing. Annie’s hand-raised pie was the star of the session! Mince pies baked, we went on to make our lemon caudle. It was a quick and relatively easy recipe. We gently heated our milk on the stove and curdled it with freshly-squeezed lemon juice. 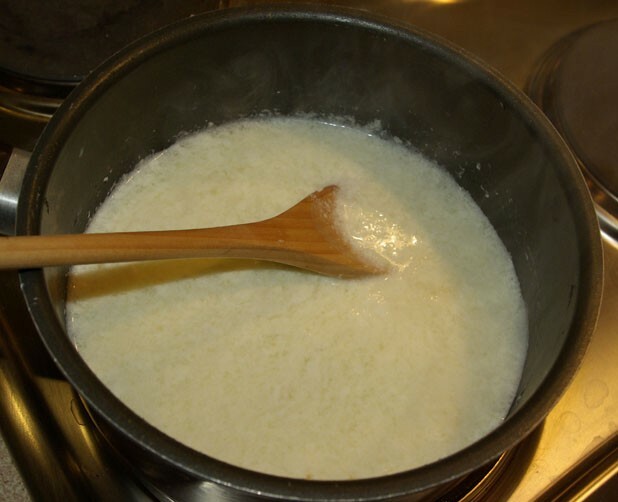 Once we were sure that all the milk had turned, we strained off the curds and discarded them. 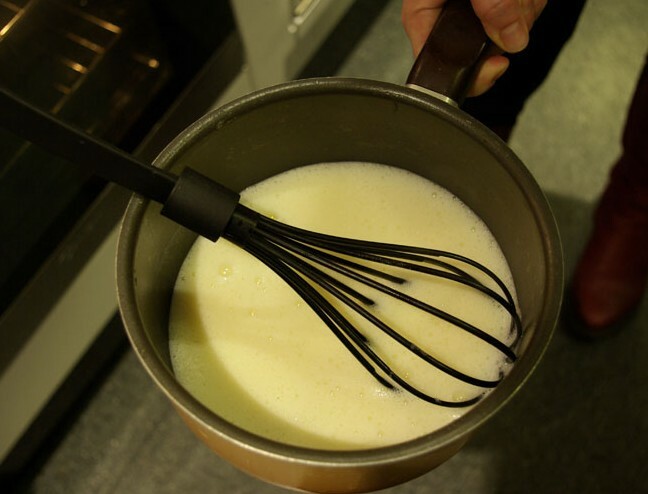 The whey was then poured over a couple of egg yolks in a large bowl, whisked all the while, and once combined was returned to the saucepan on the hob. We were really careful to keep stirring the mixture and not let it heat up too much, as while we wanted it to thicken, we definitely didn’t want the mixture to split a second time! Curdling milk to make lemon caudle. We turned the milk with lemon juice. As the caudle cooked, we began to get a better idea of what we might expect from it in terms of taste and texture. Christina thought the caudle would be a bit like custard, while Annie suggested that it would be warming and comforting – perfect for warding off the cold of winter. Lemon caudle, ready for serving! We were pleased to find our end product a pleasant, milky drink, which led some of our group to compare it to our modern day equivalent of ‘Ovaltine’. The rose water, now so strongly associated with our Georgian cookery, still added the slightly unfamiliar taste to our drink, despite the little we had added. Still unsure of this perfumed taste, Christina and Kim agreed that one glass of this was more than enough, despite its soothing taste and texture. As a post dinner treat, the combination of our mince pies and lemon caudle worked surprisingly well together. 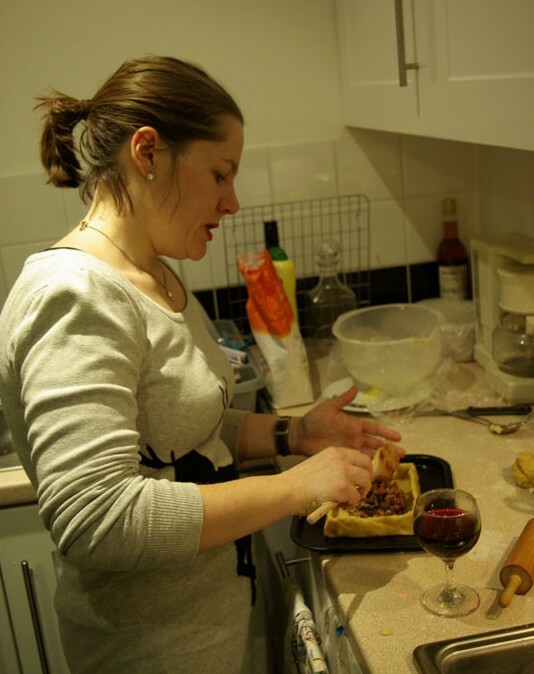 Christina was so blown away by our mince pies, she claimed they were the best she’d ever tasted! A comment to be cherished! Although our lemon caudle hadn’t tickled anyone’s tastebuds to quite the same extent, we had also enjoyed trying it out. Relaxing with a glass of mulled wine, we went on to discuss the pros and cons of historic food recreation with Annie…a lovely conclusion to a busy afternoon! 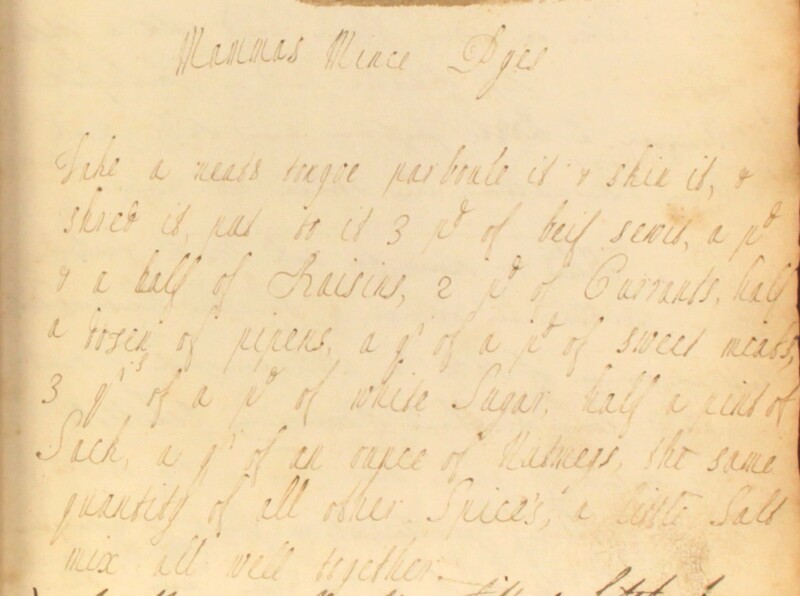 You can find the recipes we followed for the mince pies and lemon caudle on our Cooking Up History page. Why not give them a go? Whoever Mrs Townley was, she certainly knew how to bake! This cake recipe produces a light, fatless sponge with lovely fresh notes of lemon and caraway seed. The original recipe makes a lot of batter, so we halved the quantities of flour, grated lemon rind and sugar, and reduced the number of eggs to five. We also toned down the caraway flavour, adding just a couple of teaspoons of the seeds. 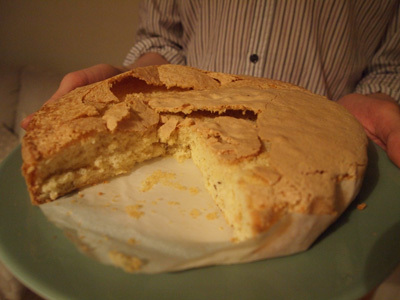 Mrs Townley’s 18th century recipe for a light sponge with lemon and caraway cake, from The Cookbook of Unknown Ladies. A pd of sugar, dryed, pounded & sifted, half a pd of flower, 12 eggs, half ye whites. The yolks & whites beat seperately. Put the sugar to yr yolks, beat them till as white as cream. Then, put in the whites by degrees. As the froth rises, great in the rinds of 4 lemons, an ounce of carray seeds. Then put in yr flower. All together mix it well. Butter yr pan. An hour bakes it. And if you’re feeling fancy, here’s a recipe for icing your cake… There’s no call for special palette knives for piping bags: a simple feather does the trick! Beat the whites of 2 eggs. Beat to a froth, then have some dubble refind sugar sifted. Take a feather, & when yr cake is bak’d, daub it over with the egg. Then sift it thick with the sugar & set in the oven to dry. We’d been hoping for a sunny day for our latest Cooking Up History session. With a summery menu of salmagundi salad and lemon-scented cheesecake on the menu, we were all set for a picnic-style celebration. As it turned out, the British Summer caught us out. 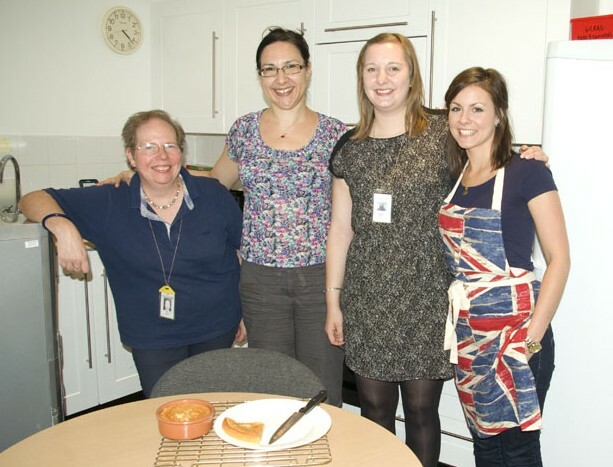 But no matter – despite the grey skies there was plenty of cheer in the Archives Centre kitchen as we welcomed back our volunteers to try out more recipes from The Cookbook of Unknown Ladies. Making up our first dish, the so-called ‘salamon gondy’, turned out to quite an entertaining experience. 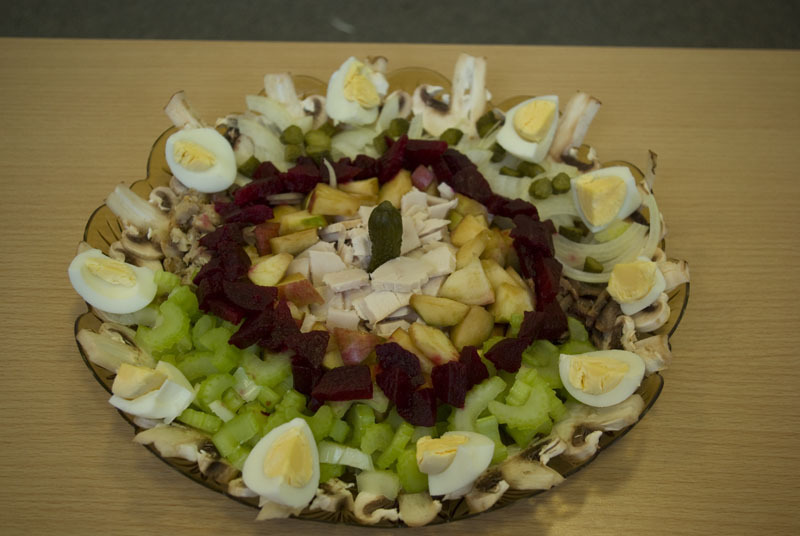 Our lengthy list of ingredients seemed fairly formidable, comprising fish, turkey, onions, beetroot, capers, gherkins, apple, boiled eggs and celery. The method was, by contrast, incredibly simple: chop and slice our ingredients into small pieces, then make up a basic vinaigrette as a dressing. Assembling our dish was the most technically challenging and exciting aspect of the recipe. We knew that colourful salads like this would have been carefully arranged to form eye-catching centrepieces for the Georgian dining table, and wanted to make sure that our version made a similarly striking impression. We discussed how best to arrange our ingredients, and checked out a few examples of similar salads online – not least Revolutionary Pie’s impressive version. Inspired, we set about constructing our spectacular salad. We were all very pleased with the finished design, a brightly coloured array of ingredients positioned in rings around the central portion of turkey breast. Archives staff member Hilary joined us for the tasting. She, along with the rest of the team, found much to be enjoyed in this eclectic salad, and thought it would make a great centrepiece at a special dinner today. Christina added that she ‘wouldn’t be ashamed to have it on my own table’. 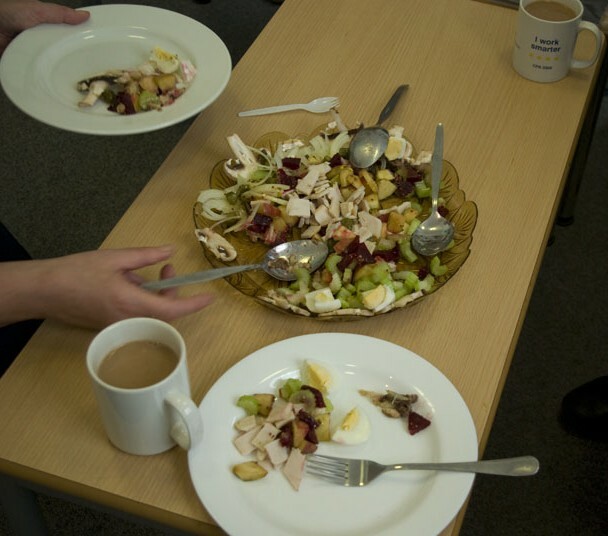 Some of us had been a bit nervous about trying the salad, as the prospect of turkey mixed with salty fish and sweet apple and beet was something of an unknown quantity. For some of us, the tastes were to be a completely new experience – Rachel, for one, had never tried herring before. In the end we were all pleasantly surprised, and our enjoyment of the finished dish matched the fun we’d had creating it. With so many different flavours, at first every mouthful we ate was very different from the last. But as we continued to taste it, the flavours merged well, with the salty anchovies offsetting the sweetness of the apple, and the turkey acting as a nice, neutral counterbalance to the punchy onion. Of course, our unknown ladies’ version of the salad may have tasted quite different had they opted for ingredients that had been preserved in other ways. We’d chosen fresh beetroot, and anchovies and herrings in oil. If the 18th century cooks had instead gone for fresh fish or pickled beetroot, the final effect could have been quite different. As with so many of the recipes in the Cookbook, the vague listing of ingredients leaves room for interpretation. Would we make it again? It was certainly one of the healthier recipes we’d tried from the Cookbook. Rachel found the combination of flavours and textures was actually quite modern – the sort of thing you’d pay an arm and a leg for at a swanky London café. The Georgians may have been less concerned with the healthy attributes of the dish, but they did pay considerable attention to making sure each meal comprised a balanced selection of dishes. What better counterpart to a stomach-filling roast than a fresh, light salad? And, as Judith pointed out, the salmagundi was another example of how the 18th century cook could concoct something spectacular out of economical, everyday ingredients. 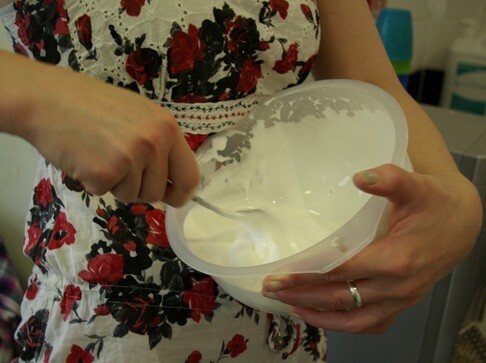 Rachel prepares the lemon cheesecake batter – plenty of muscle work required! We prepared a lemon cheesecake for second course, mixing together almonds, lemon, eggs and a large amount of butter. The recipe offered us the choice of adding either orange blossom water or rose water to our recipe. Rachel suggested that orange would enhance the citrus tones of the lemon, and Kim recalled how rosewater was sometimes pretty overpowering when we’d used it in other dishes, so we plumped for orange blossom. The finished cheesecake – so named because of its cheese-like-texture rather than any cheese in the recipe – delighted us all. 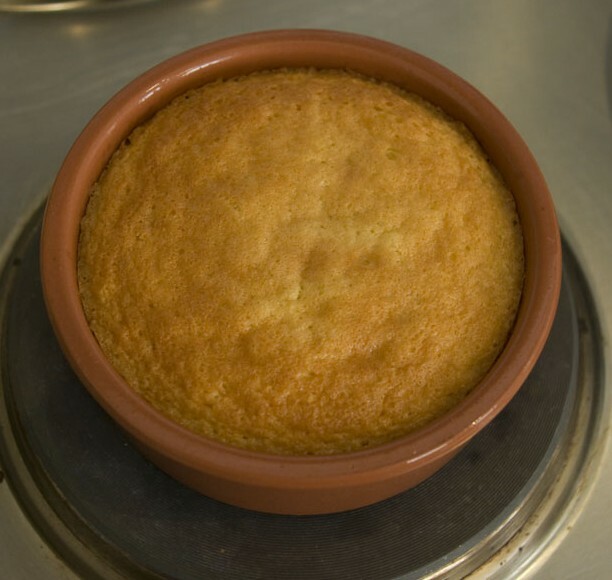 Fresh out of the oven, it had an extremely pleasing appearance: a lovely golden brown with a firm consistency. The combination of citrus fruits was really delicious. Hilary enjoyed the subtle fragrance of our orange water with its ‘scented after-taste’ and Christina was so taken with it she said she’d bake the dish again at home. Christina serves up the cheesecake for the all important tasting! Previous dishes tried out by our Cooking Up History group, such as the almond puddings of our first session, had included so much butter that they’d been rather too rich for modern tastes. We’d feared something similar this time round, there being 220g to just 150g of almonds in the mix. But we needn’t have worried – the cheesecake wasn’t too rich at all. 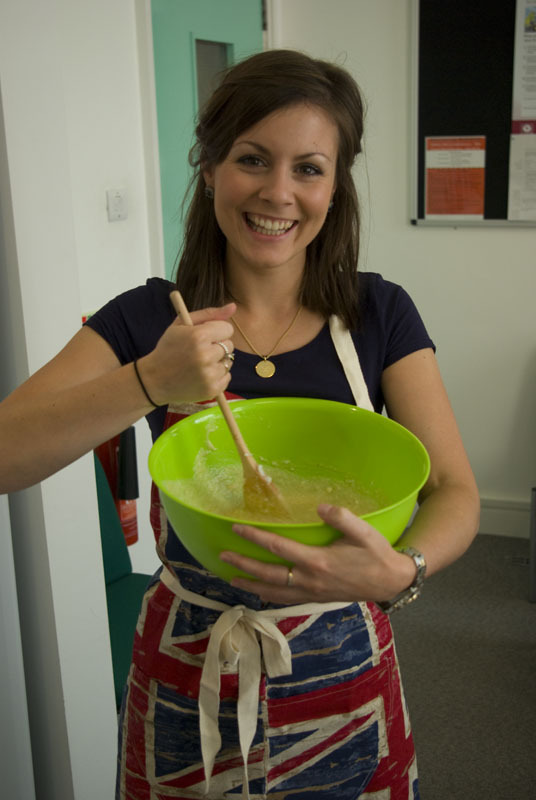 If you’d like to give any of our recipes a go, check out our Cooking Up History pages! 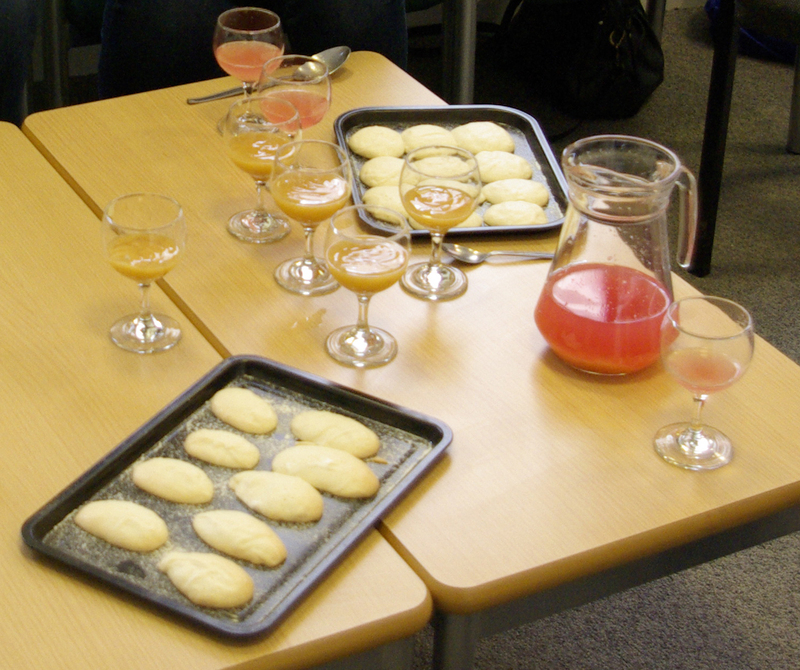 Our Cooking Up History group really enjoyed making up lemon creams at their latest historic cookery session. It seems that this dish was rather a favourite in the household of our ‘unknown ladies’ too! 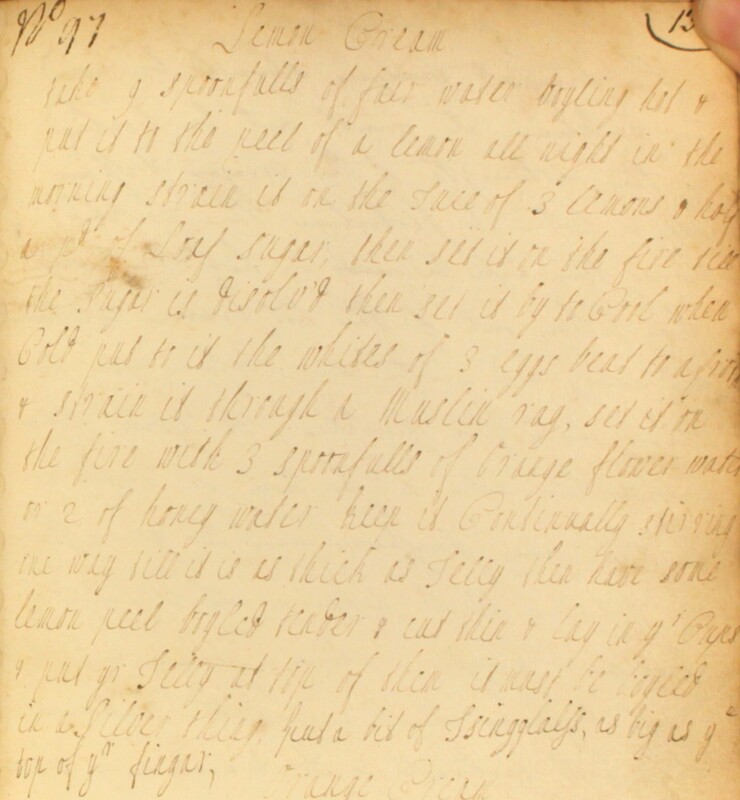 There are three entries for lemon cream in the Cookbook, but two are written in the same handwriting and are identical but for a few variant spellings. 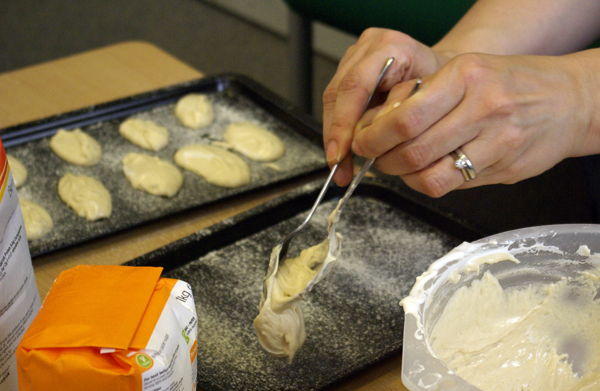 Compare the recipe below to the ‘lemmond cream‘ method that inspired the Cooking Up History group in June… can you spot any differences? 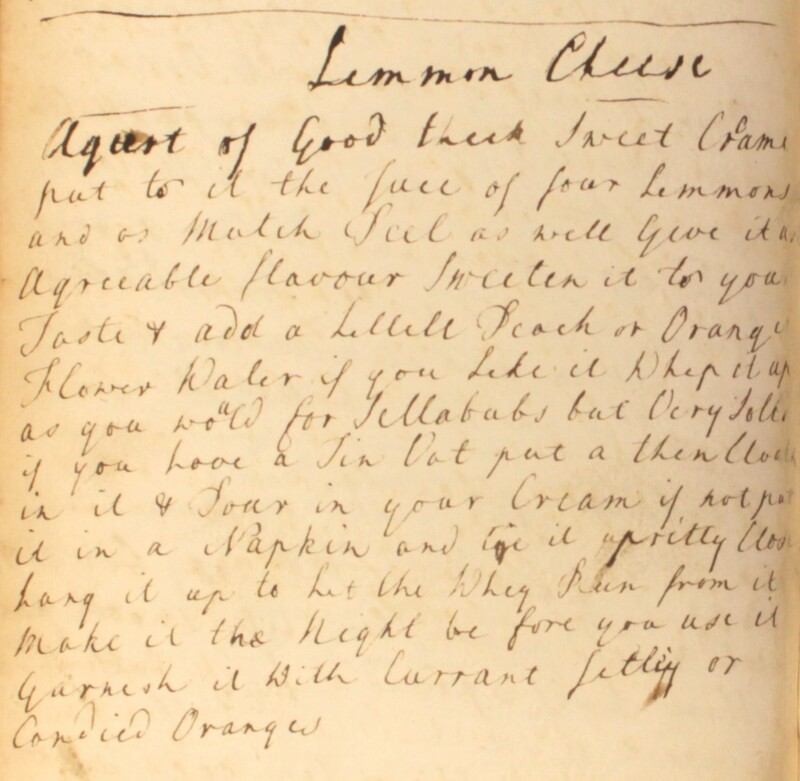 This “Lemmon Cream” recipe is nearly identical to the one followed by our Cooking Up History group. To four large lemmons squees’d put 3 qrs of a pd of ye finest loaf sugar, 8 or 9 spoonfuls of water & a piece of ye peel. Set it over ye fire until ye sugar is melted. Put in ye whites of 4 eggs & strain it through a napkin doubled. Set it on ye fire again & stir it all ye while. When it grows thick, take it off. Put in two spoonfuls of orange flower water. Lay some shreds of boyled lemmon pele at ye bottom of yr glasses. The following recipe varies from the latter not only in the quantities used, but also in the level of detail in the method. The author gives full instructions for boiling the lemon peel, and even specifies that it should be boiled in ‘a silver thing’, supposedly to avoid potential poisoning from using a pewter dish. 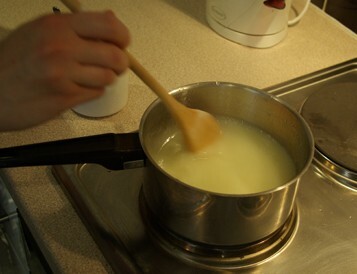 To help create that extra wobble, a piece of isinglass is added to set the cream. Take 9 spoonfulls of fair water boyling hot & put to it the peel of a lemon all night. In the morning, strain it on the juce of 3 lemons & half a pd of loaf sugar. Then set it on the fire till the sugar is disolv’d. Then set it by to cool. When cold, put to it the whites of 3 eggs beat to a froth, & strain it through a muslin rag. Set it on the fire with 3 spoonfulls of orange flower water or 2 of honey water. Keep it continually stirring one way till it is as thick as jelly. Then have some lemon peel boyled tender & cut thin & lay in yr cups & put yr jelly at top of them. It must be boyled in a silver thing. Put a bit of Isingglass as big as ye top of yr finger. If you’d like to try this popular 18th century dish at home, you’ll find a step-by-step method on our Cooking Up History page. Don’t forget to let us know how you get on! 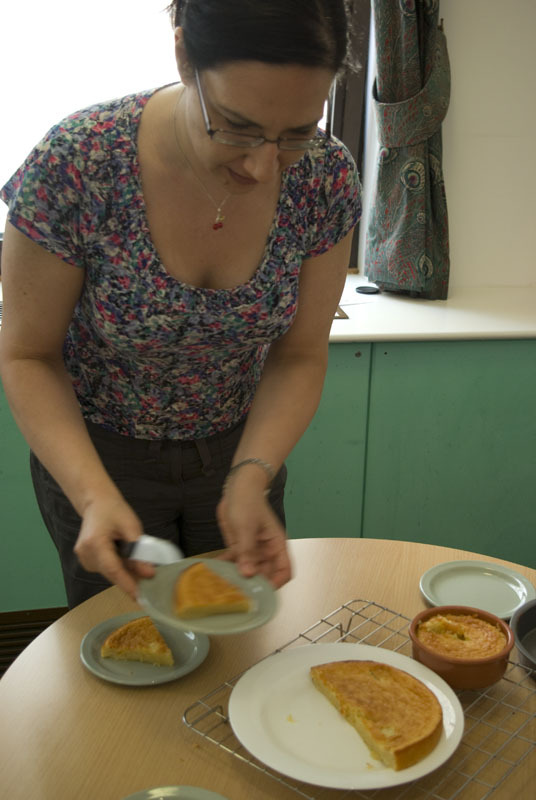 Our Cooking Up History volunteers returned to the Archives kitchen at the end of June to try out some more recipes from The Cookbook of Unknown Ladies. And how better to celebrate the onset of summer than with a table laden with lemon creams, Savoy biscuits and a jug of refreshing spring fruit sherbet? We were all excited about the menu, and pleased to find we were starting to become familiar with the tastes of the Georgian period. 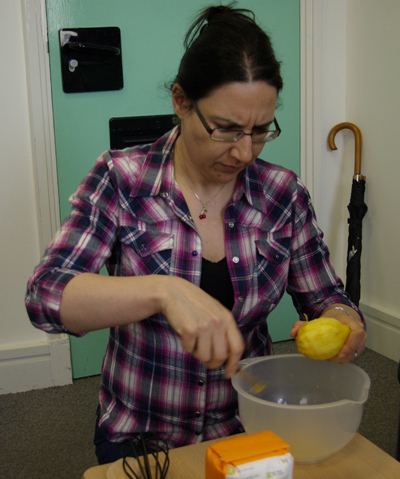 As Christina set to work zesting the lemons for our ‘lemmond cream’, she remarked how popular citrus seemed to be with the Cookbook’s compilers. In the early part of the 18th century oranges and lemons were still relatively expensive, and it is unlikely that our unknown ladies had their own orangery or glass-house where the fruits could be grown. We can only assume that their household brought in enough income to allow them the luxury of lemons in their puddings! 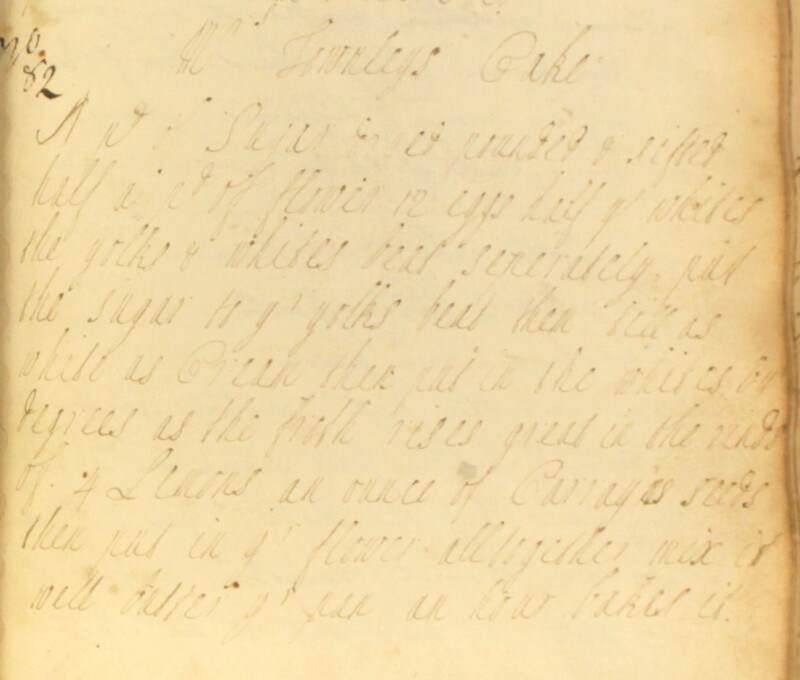 Our first recipe sounded rather appetising: a refreshing mix of lemons, sugar and eggs would go into making our Lemmond Cream. It was quick and easy to make up the mixture, although we all observed that it took much longer to thicken on the heat than we’d anticipated. Perhaps this was a touch of 21st century impatience coming into play? The end result was a sweet-smelling and “extremely strongly flavoured” dish which defied all the expectations the name had given us. A splash of orange flower water lent the creams a highly-perfumed flavour, but the appearance was rather less appealing. We’d all expected a light creamy colour, but they actually turned out a rather lurid yellowy brown! Maybe the long process of thickening the mixture on the stove had led to the sugar caramelising a bit. The texture looked a little grainy but was in fact very smooth to the taste. On balance, we all quite liked the creams, but a few felt the flavours were a little on the over-powering side. David, on the other hand, could have done with even more of a punch: he felt that by straining the mixture and removing the zest we’d lost a strong element of our ingredients, which could have provided added layers of extra texture and taste. 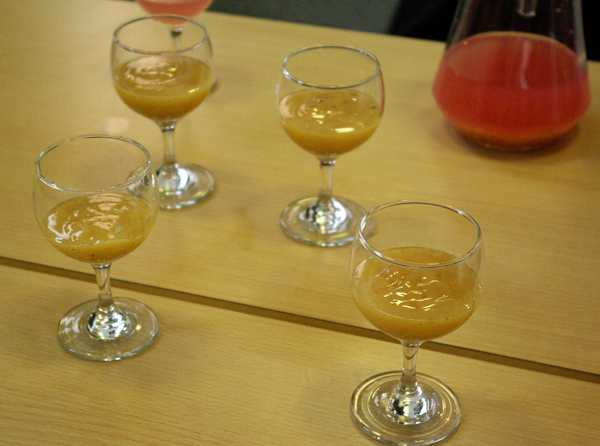 Kim had prepared the Spring fruit sherbet earlier on in the day: an infusion of rhubarb, water, lemon and sugar syrup. It had been cooling in the fridge for some five hours by the time we came to try it. 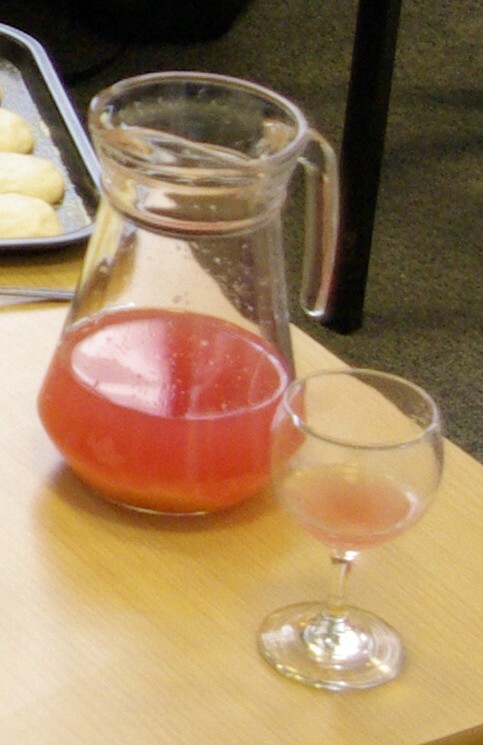 Everyone admired the pretty pink colour of the drink – a bit like pink lemonade or a summery Pimm’s punch – but its taste really divided opinion. Some were extremely keen. Georgina felt the blend quite purifying whilst David claimed it to be ‘very tart’ – not necessarily a bad feature in David’s opinion! And Kim was at the other end of the scale, needing to add extra sugar to her glass as it was far too bitter for her. Angela stood somewhere in the middle on all this, finding it not bad at all, but wondering whether a more dilute version might be better. The Savoy biscuits were the highlight of our afternoon’s cookery escapades. The method was easy to follow. David commented that these biscuits seemed likely to have been made in large volumes, although following the extremely lengthy whisking of our eggs we questioned how easy this method would have been for a greater quantity in a Georgian household. 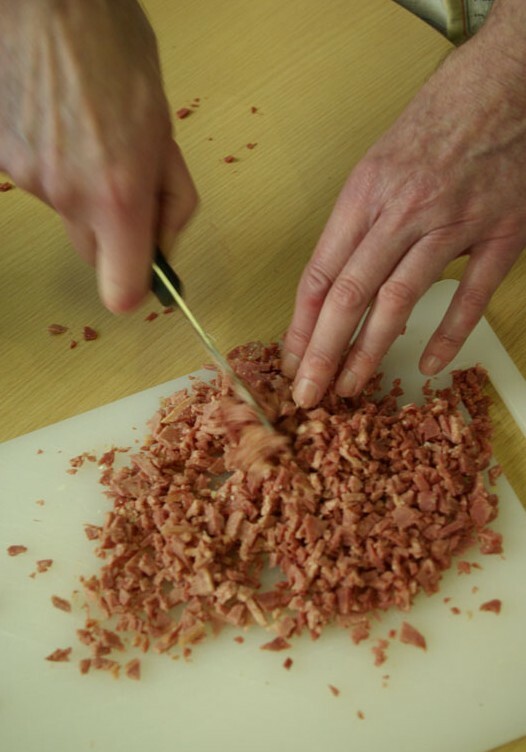 Today we would normally have resorted to an electric beater but perseverance by Angela and a fork eventually paid off to give us the desired soft peaks! The biscuits took 20 minutes in our electric oven and were very aesthetically pleasing, with a light brown colour. This, combined with the soft and slightly chewy meringue texture, meant they went down really well with all of the team. The recipe specified that these biscuits would be “proper with tea in an afternoon” and so we popped the kettle on and enjoyed a good brew. A relief to Kim, who had been less than keen on the spring fruit sherbet! Savoy biscuits, lemon creams and spring fruit sherbet: our Georgian-style spread! What a lovely afternoon! David and Christina both commented how well everything had turned out, and what a nice spread it had been. 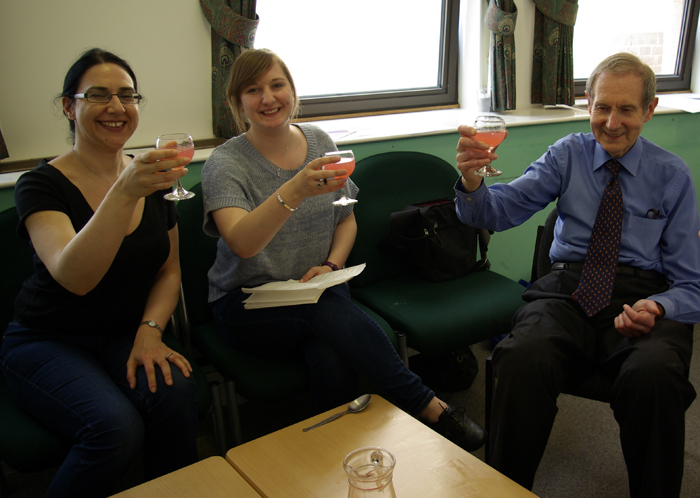 A proper summer tea, which was certainly well-deserved by our Cooking Up History team! Fancy having a go at these recipes at home? Visit our Cooking Up History section for all the details!